Lazy Saturday afternoons in the summer are what I like best. If food preparation threatens to destroy the mood, I will now turn to this quick side dish that pairs nicely with a good solid protein like salmon steaks or even an organic grass-fed weiner (yes, they are out there). 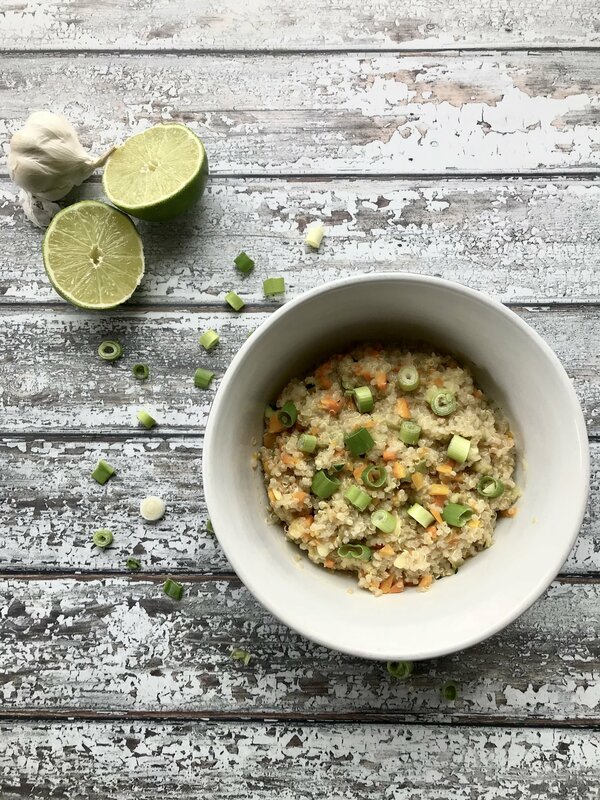 This recipe has sweetness, tartness and zip from the chili; and the carrot and zucchini add a little roughage to make me feel I’m taking care of my little Coco’s nutritional needs. This quick, easy and tasty recipe was inspired by none other than my sparse fridge contents. Why you may ask was it sparse? Well, without ranting and raving endlessly about how our fridge broke down yet again let me just say my husband was resourceful enough to get a stand-in while our other one gets fixed. This one is very small and as I write stands proudly in our entrance way greeting all guests who stop by. Less room, less food. But that doesn’t mean I can’t be creative. I gathered up the ingredients that greeted me when I opened the door and laid them out on the counter. Yes, I could do this and it would be quick and painless because my Saturday afternoon will be spent relaxing on my deck one way or another. I’ve got an especially exciting book to read called My Name is a Knife by my ultra-talented friend, Alix Hawley. Perhaps that’s my real inspiration then–build something quick and healthy so I can get back to reading the saga of Daniel Boone. I joked with Alix not long ago that if I write a recipe book, I’ll borrow parts of her title: My Name is Spoon Fork Knife. It won’t have nearly the emotionally-charged characters and drama but you can snack on my recipes while you have your “me” time on the deck reading Alix’s stellar book. Quinoa: Higher in fiber than most grains and it’s gluten free! Zucchini: Since it’s 95% water, it’s excellent hydration for the body. When you have little time in the day for your creative pursuits, you want a nutritionally dense food for the kiddos that tastes awesome and can be made quickly so you can get back to it. You know that book you've been trying to read? Make it happen when you cut out some of the time you spend preparing in the kitchen. Step 8 Serve with love and green onions and enjoy!